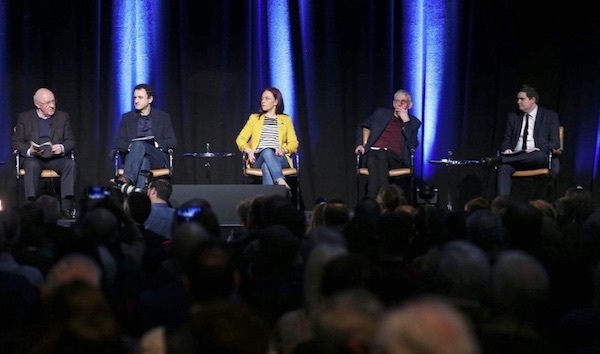 A ‘civic nationalism’ event has drawn an estimated audience of 1,500 to a conference in Belfast’s Waterfront Hall to discuss a response to Brexit. The event was organised by a group of prominent nationalist professionals who have previously drafted open letters calling on the Dublin government to provide greater protections for the rights of Irish citizens in the North after Brexit. The conference heard contributions from a range of politicians, including 26 County politicians Fine Gael Education Minister Joe McHugh and Fianna Fáil deputy leader Dara Calleary, although unionists were not involved. The conference was significant in that it showed that middle-class nationalists have moved away from the concept of post-nationalism and the idea that the conflict in Ireland has been resolved. However, it was criticised for making no effort to include working class nationalists and republicans, and there were reactionary denunciations of physical force republicanism from the stage. On the other hand, many of the speakers reflected a growing interest in republican ideology, as did the audience. There were cheers for those who called for immediate steps towards unification, while calls for a return of the Stormont Assembly were greeted with silence. In the strongest statement of the day, Sinn Féin leader Mary Lou McDonald called on Dublin to convene a forum in a bid to begin planning for a poll on Irish unity, despite Britain’s refusals to allow it. Ms McDonald said the British Brexiteers’ “policy of isolation” would not be tolerated. “A crash means a hardening of the border and the loss of rights and continued uncertainty and instability - a hardening of the border is inconceivable and will be met with the demand for a unity referendum,” she said. The Sinn Féin leader highlighted how Ireland was facing uncertainty and how its fate currently lay “in the hands of a minority Tory government in London”. She said it was irresponsible and arrogant for the Dublin government to dismiss any prospect of a unity referendum. Mrs McDonald issued a direct message to the unionist community, saying they would “have a home in a united Ireland”. “You will have a place at the table, a place at the centre of political life and not left in the margins of Westminster,” she said. However, SDLP leader Colum Eastwood said now was not the right time for a poll on removing the border. He said some unionists were “willing to engage and explore new possibilities” and that they should have nothing to fear from a conversation about Irish unity “based on persuasion and consent”. “My appeal to unionism is this - try to convince us of your vision for the future and we’ll try to convince you of ours - and then in time let the people decide,” he said. Fine Gael’s representative at the conference said there should be no unity referendum, but there was a need to “protect the peace process”. “The impact of Brexit will of course be felt across this island in many different ways,” said Joe McHugh. Ironically, McHugh’s government subsequently refused to allow a debate on Irish reunification in the Dublin parliament this week, on the basis that such a discussion would be “hypothetical”. Earlier in the day, an elaborate protest was held against Brexit on the border near Newry, where Sinn Féin’s theatrical department helped to construct a mock wall across a border road. 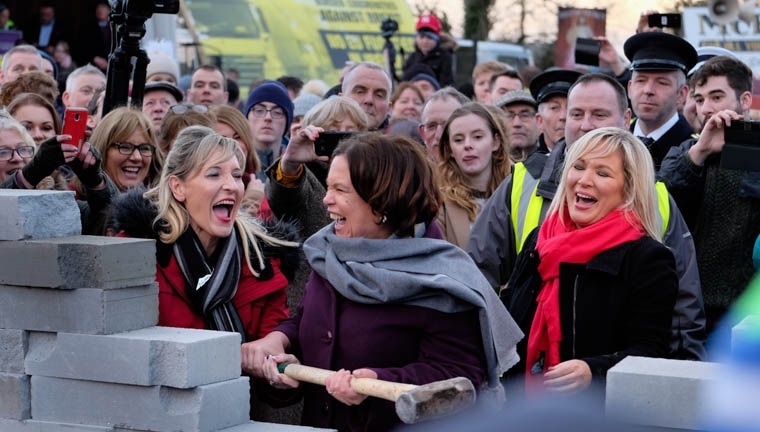 It was then symbolically ‘smashed’ for the cameras by Sinn Féin leaders Mary Lou McDonald, Michelle O’Neill and Martina Anderson, wielding a sledgehammer. The performance also included a mock spy-post manned by two men wearing British army uniforms and camouflage make-up. The organisers said they wanted to send an “unmistakable signal” that imposing border infrastructure would not be tolerated by local people. Meanwhile, unionists have been organising their own events and raising funds, in order to support a hard Brexit and a return of the hard border. A DUP event in the Tullyglass Hotel in Ballymena on Wednesday night featured chief Tory Brexiteer Jacob Rees-Mogg, who has previously called for the return of “historic arrangements” at the border “to have people inspected”. It was also attended by notorious Brexit campaigner Arron Banks, who is under criminal investigation for breaches of electoral law and has been fined for breaches of data protection law. Banks praised the DUP at the event. “If Brexit gets delivered, it will be because of the DUP,” he told reporters. Another guest was loyalist Jamie Bryson, despite his alleged links to the east Belfast UVF, the paramilitary organisation blamed for the murder of a community worker in the area just last week. The event was hosted by disgraced DUP MPs Ian Paisley and Sammy Wilson, who are both mired in controversy. Paisley is currently the subject of a number of financial scandals, most recently a first-class, all expenses trip to New York which was controversially paid for by ‘peace charity’ Co-operation Ireland. The event showed the DUP and their supporters will not be suffering any food shortages -- the #10,000 fundraiser, billed as an ‘evening with Jacob Rees-Mogg’, included a “cooked buffet supper”.